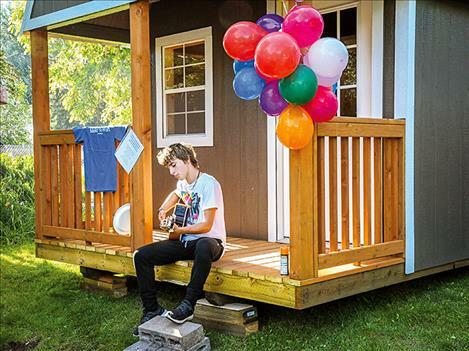 Iliff plays the guitar on the porch of his gifted recording studio during a celebration picnic held in his honor. 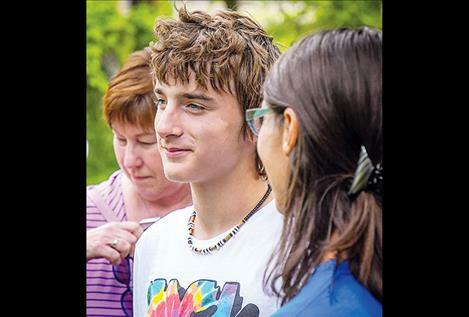 When 14-year-old David Iliff walked into his backyard last Tuesday afternoon, he discovered that his greatest wish had been granted. 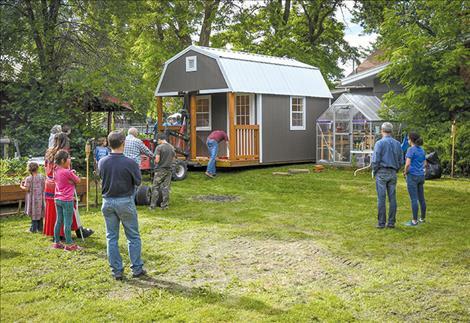 When Iliff left for his grandparents’ house earlier that day, a crew of family, friends, and volunteers moved a free standing guitar studio into his backyard. When he came home, the pre-fabricated building stood in the grass near the family’s garden. A crowd of more than 20 people had gathered to watch the surprise reveal. Make-A-Wish Montana facilitated the donation of the studio, with support from local businesses and volunteers. After he looked at his new laptop and recording equipment and climbed into the loft in the studio, Iliff said that he was excited that the studio would allow him to take his love of music to the next level. He plans to start recording his music. He’ll also use the space to make music with friends. Iliff, a rising freshman at Polson High School, was diagnosed with Burkitt’s lymphoma in June 2017. After four months of treatment at hospitals in Denver and Kalispell, his illness was cured. Iliff’s doctor at Kalispell Regional Medical Center referred him to Make-A-Wish. Make-A-Wish is an international nonprofit organization that serves children with life-threatening illnesses. A child tells the organization about a gift or experience that they want, and Make-A-Wish finds funding and organizes logistics to make the wish come true. The Montana chapter of Make-A-Wish, which fulfills about 40 wishes in the state each year, granted Iliff’s wish. Wish granter volunteer Sally Crist lives in Ronan. She learned about Iliff from the Make-A-Wish Montana database and was excited to help grant the wish of a child in her community. She became a volunteer with Make-A-Wish after her own daughter received a wish through the organization. “He knew right away” that he wanted a recording studio, Crist said. “He loves music,” Iliff’s mom, Syndee Hunter said. Iliff has been playing guitar since he started taking lessons five years ago. He plays covers on the electric and acoustic guitar. Hunter said that Iliff purchased a new acoustic guitar the day before the wish reveal party. Premier Portable Buildings donated the structure that is now Iliff’s studio. 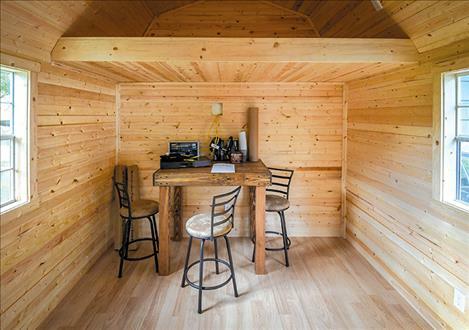 When Crist contacted the company to ask if they would discount the price of the building that would fulfill Iliff’s wish, she was told that Premier Portable Buildings would donate all of the materials. Max Koehn, Regional Sales Representative for Premier Portable Buildings, asked the employees at the shop in Pablo if they would donate their labor to construct the building, and they agreed. The following local businesses donated to make the wish a reality: RJ’s Electric, Mission Lawn, Pleasant View Construction, Hammertime Construction, Dutter Builders, Darrell and Sarah Stone, Western Building Center, Stageline Pizza, Ronan Harvest Foods, Ronan Ace Hardware, Ronan True Value Hardware. Iliff said he only knew about half of the people at the wish reveal. The others were community members who had been involved in granting the wish. “I think it’s pretty neat that all these people had something to do with it,” he said. Jamie Hess has known Iliff since he was a young child. Her children grew up with Iliff and his siblings. She said that it was “very scary” when Iliff was diagnosed.